The Peyote Cult, or Native American Church, involved the use of peyote which is a small, spineless cactus that contains mescaline and can be used for the hallucinogenic effects it provides. The use of peyote as a medicine and a way to reach divine clarity took place before Columbus came to America, but the religion became fully realized and started spreading in 1885. Peyote practices around and after this time had cultural characteristics from both Mexican and Native American practices. The Native American Church uses several instruments in their rituals. The peyote gourd rattle is used when singing peyote songs during rituals. There is also a water drummer that uses a modified iron kettle as a drum while the singer sings and uses his rattle. The water drummer uses a hard wooden stick made from thick wood that produces a strong sound when used on the drum. The last ritual tool they use is the peyote staff, which is passed around the group and is held upwards during ceremonies as it is a representation of a holy god. There are various different ceremonies and ways of conducting them, but there are/were two main styles used. The first one is known as a “half-moon” fireplace. This ceremony involves the use of tobacco and very little connection to the Bible. The second ceremonial meeting, the “cross fire” fireplace, is the opposite because tobacco is not used and the Bible is used almost exclusively. This is one example of how indigenous religion blended together with the Christian doctrine and belief system. “Native American Church.” Wikipedia. Wikimedia Foundation, n.d. Web. 23 Sept. 2015. The story you are about to read, Of The Girl Who Married Mount Katahdin, is one of many early Penobscot Indian stories. These stories, however, were not originally written down. This story, as well as countless others within the Penobscot tribe, were oral stories. These were traditionally kept alive by the act of passing the story down from elder members of the tribe to younger members. The Penobscots were natives of Maine, therefore crafting stories about their landscape. Mount Katahdin, which means “The Greatest Mountain” in Penobscot culture, is the highest point in Maine, and was originally named by the Penobscot natives. It wasn’t until white ethnographers began recording these cross cultural encounters that these stories became solidified in literature. Charles Leland, the self-claimed “author” of the story as well as one of the first ethnographers to collaborate with the Penobscot natives, was a man of many interests. Originally born in Philadelphia, Pennsylvania on August 15th, 1824, Charles Godfrey Leland was educated at Princeton University, where he became interested in both European and American folklore. After spending time in France and Germany, Leland came to America, where he made contact with the Algonquian tribes. These tribes were situated all throughout northeastern New England, as well as large parts of Canada. He studied as well as lived with the Penobscot natives, recording their culture. The term Ethnography is defined in the Merriam-Webster Dictionary as “the study and systematic recording of human cultures.” The ethnographic researcher views the society from the subjects view. The use of ethnography is to study, understand, and ultimately preserve a culture. The use of ethnography within the Penobscot culture was to help the “American” people that lived in New England at the time to better understand the life and culture of the natives. Since it is a holistic study, meaning all encompassing, ethnographers were encouraged to include everything they possibly could about their experience with the culture. Of the Girl who married Mount Katahdin is an example of Realistic Ethnography, which is described as a simple, objective account of their experience, story. In Leland’s case, he simply wrote down the story that he heard from Mrs. Marie Sakis, an older Penobscot story-teller. 1) What might be the significance of the child’s eyebrows being stone? Why not any other part of his body? 2.) How might this story tell the “fall of man” through a native standpoint? What are some surefire signs that it is or isn’t? Wikipedia Contributors. “Charles Godfrey Leland.” Wikipedia. Wikimedia Foundation, n.d. Web. 28 Sept. 2015. “Native Languages of the Americas: Penobscot (Eastern Abnaki, Penawahpskewi, Penobscott).” Native Americans: Penobscot Indian Tribe (Penobscot Nation, Penobscott, Penobscots). N.p., n.d. Web. 28 Sept. 2015. “Ethnography Definition.” Merriam-Webster. Merriam-Webster, n.d. Web. 28 Sept. 2015. The Cherokee tribe originates in the southeastern region of the United States, more specifically present-day Tennessee, Georgia, North Carolina, and South Carolina. The Cherokee refer to themselves as Ani-Yuwiya, which translates to “principal people”. In the 19th century, the Cherokees were viewed as one of, if not the most socially and culturally advanced native tribe in the United States. They were referred to as one of the “five civilized tribes”. Once gold was discovered on Cherokee land, prospectors and settlers alike scrambled to the area in an attempt to acquire the bounty of earthly riches. Despite their impressive reputation, the Cherokee were forcibly removed by then president Andrew Jackson under the Indian Removal Act of 1830. This mass exodus, also known as the Trail of Tears, disrupted the lives of the Cherokee people and ended in the death of 4,000 Cherokee whether by hunger, disease, or exhaustion. The following story, entitled The Origin of Disease and Medicine, weaves a tale of how disease came to be and the way in which the cures for these diseases were discovered. This text, told orally before it was translated by James Mooney, portrays the natural conflict between animals and plants. The animals are irked by humanity’s careless attitude towards them and wish to eradicate them, while the plants are sympathetic towards humanity and seek to save them from certain death. The Cherokee tribe has a strong connection not only to the natural world itself, but more specifically to botany. As a culture entrenched in herbal healing and plant identification, it is only appropriate that their literature would too be steeped in naturalistic themes and information. This next Native American text was written down by Charles Lelands in 1884 in a collection of stories called The Algonquin Legends of New England, but because it is likely that the story was originally told orally before it was transcribed into written words, its unclear when exactly it was created. This story focuses on the Algonquin mythical figure of Glooskap (also spelled Glooscap), as many Algonquin legends do. According to Wikipedia, the Algonquian people “are one of the most populous and widespread North American native language groups, with tribes originally numbering in the hundreds of thousands” (Wikipedia). In “How Glooskap went to England and France,” the mythical being, Glooskap, builds a stone canoe and sails to England with his mother. When he lands in London, he tells the Europeans about America. From there, he continues on to France to have his mother baptized as a Catholic before returning to America. The legend states that Glooskap and his mother’s return sparked the influx of Europeans to America. This is an example of a “first contact” or “discovery” story because it tells of an initial interaction between Natives and Europeans. 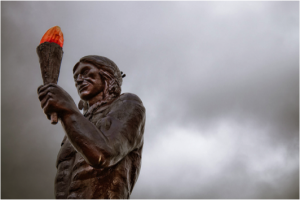 Legends like these are important because they help to give us a sense of how the initial interactions between Native Americans and Europeans were experienced. The Open Anthology of Earlier American Literature: A PSU-Based Project by Shannon Griffiths, Kendal LaRiviere, David MacNeill, Timothy Mooneyhan is licensed under a Creative Commons Attribution 4.0 International License, except where otherwise noted.